Oh, what a celebration of nature with colours so beautiful and a quote so joyful. Julia, your artwork is superb. I love the patchwork effect and the vibrancy of your picture. You are a true artist. I love the quote and the sweet birds. The colors you have used are so lovely. What a great piece of work, Julia. Love it!! simply lovely!! beautiful composition and the colors are perfect!! What a stunning piece of art, so vibrant! Such a beautiful stroll through your nature garden Julia- this is stunning! i just keep wondering HOW you manage to do so BEAUTIFUL artwork! love all about this collage, it is divine!! It´s simply perfect!!! I must say again that I love your way to use colours! Just beautiful! 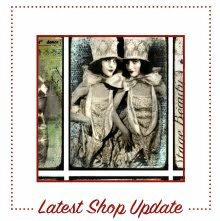 Blog hopping a bit this morning for inspiration and see what's new in your shop too - not disappointed, let me tell you. Your work is just so lovely and vibrant and always makes my heart skip a beat. Have a good weekend! What a patchwork of beauty, Julia! It's a feast for the eyes. Thanks so much for sharing! OMG what a beautiful creation. 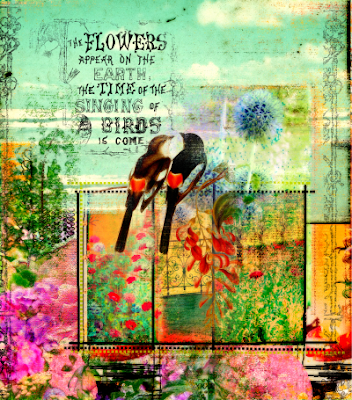 Wow... the colors are sooo bright and beautiful.. Love the birds and the quote! Gorgeous artwork and a good word from Eccleciastes. I always love to see what you create and you never disappoint Julia ~ I absolutely love the colors, the birds, all are favorites! Fabulous art creation! Fabulous art work, Julia! Love such colorful pieces! Beautifully done! Wow it's so cute !! I love these colors !!!! This almost looks like an art quilt--love the colors and the dimension to the collage--it's beautiful! This is truly gorgeous, Julia! I love your use of colour in all your artwork. I love that picture! It is so romantic! This is something unbeliveable beautiful,you are so good! what a phenomenal piece. just gorgeous.